What is the minimum or maximum quantity I can mail? To qualify for our mailing services you must mail a minimum of 500 pieces. We do not have any maximum, however, our website provides pricing up to 20,000 pieces. If you have more than 20,000 pieces to print and mail, contact our quoting department for pricing. 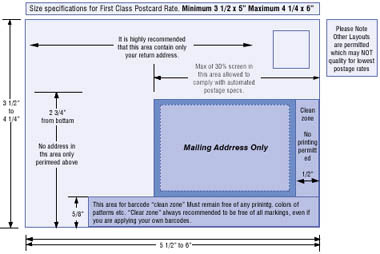 What are the USPS postcard design requirements? All specification on the templet as shown below should be strictly adhered to. Any noncompliance with this layout may result in a rejection by the postal authorities which may further result in your piece failing to qualify for the lowest possible postage rates. What are the USPS requirements on the postcard size and thickness? If the width is less than 5 inches or the height is less than 3.5 inches the USPS will NOT mail your postcard. If the width is greater than 6 inches or the height is greater than 4.25 inches, the postcard must be mailed as a letter, higher rate and all. A 4 x 5.5 inch postcard is mailable at the postcard rate. As long as a mail piece meets the size, thickness, weight and aspect ratio requirements above, it can be mailed as a postcard. Any mail less than the minimum is considered Non-Mailable and the USPS will NOT deliver it. Exceeding the maximum puts the mail piece into a different mail class, called a Parcel.